FUNDAR has collaborated with several municipalities and other entities in the management of archaeological resources in their jurisdictions. The Municipality of Tecoluca (Department of San Vicente) requested our collaboration for the management of the Tehuacán archaeological site. FUNDAR undertook and evaluation of site limits and structures in this major site (which were until then unknown), and defined a polygon referenced with geodesic points for its description. Despite its proximity to Tecoluca, the site turned out to be just outside of the municipal borders, leading to a discussion about its protection through possible joint management with San Vicente (the municipality which does in fact encompass the site). 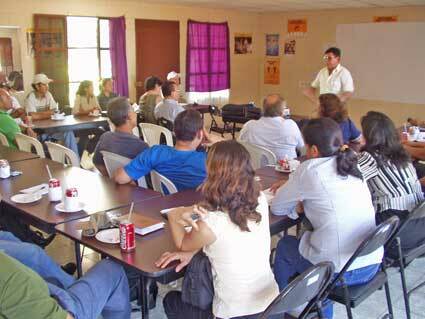 FUNDAR participated in meetings on the social and cultural development of Tecoluca, in which Tehuacán was discussed. Left: Mayor Carlos Cortéz and Architect Roberto Dada. 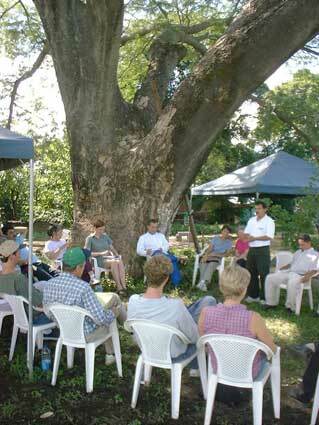 Right: One of the meetings held under an immense conacaste tree. 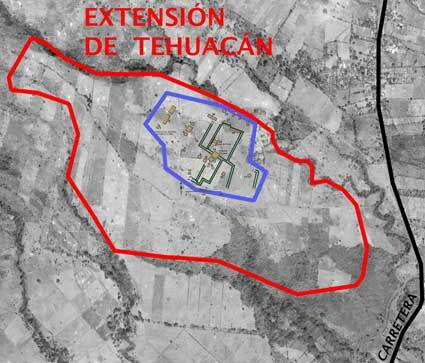 Left: The extension of the Tehuacán site, as determined by FUNDAR, is shown in red. An ample residential area surrounded the monumental zone of the site (in blue). 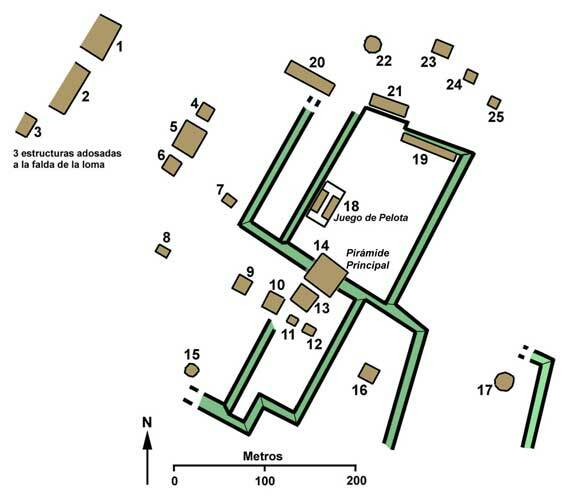 Right: Tehuacán's monumental zone has several huge terraces (green), pyramids, a ball court, long platforms, and other structures. 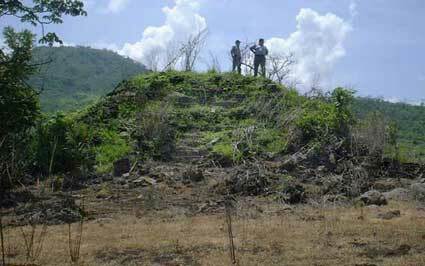 Tehuacán is a Late Classic site closely affiliated with Quelepa, with which it shares Shila and Lepa phase occupations. 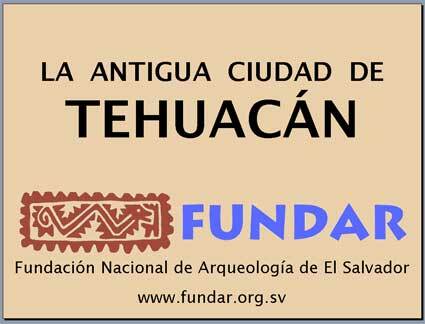 With the information gathered by FUNDAR, the Municipality of San Vicente consulted with us about the possibility of protecting Tehuacán as an archaeological park. FUNDAR furnished maps and descriptions about the site and its limits, and recommended that the first task would be to adquire the land with, at a minimum, the monumental zone, and ideally with the entire site and a buffer zone. Pending this purchase, it was also recommended that the municipality issue a decree specifically for the protection of Tehuacán. The main obstacle in protecting this and other sites is the lack of available funds for land purchase. This information was also presented in a public meeting organized by the municipality. 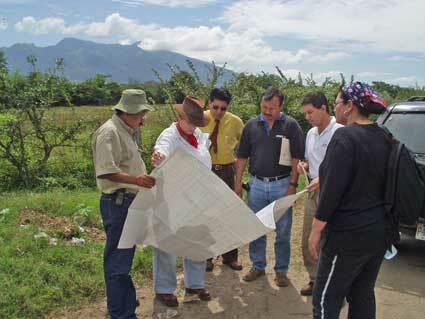 ABOVE: Meetings with the Municipality of San Vicente about the Tehuacán site. Left: Karen Bruhns with city council members and technicians. Right: A public presentation about Tehuacán is introduced by Carlos Cortéz (standing, Deputy of the Legislative Assembly) and Mayor Rigoberto Saravia (at center). The presentation was given by Paul Amaroli (right). BELOW: The first slide of the presentation. There are many important sites in the jurisdiction of the Municipality of Guazapa, and all are very vulnerable. FUNDAR has denounced several instances of destruction at these sites, including the extraction of stone (sold as construction material), the demolition of entire pyramids, and subdivisions, because of which we have had several meetings with CONCULTURA and the council. At the mayor's request, FUNDAR has made two presentations about the municipality's archaeological heritage. The basic message in these presentations is the urgency of protecting these sites with municipal decrees and, above all, their acquisition to create parks, be they municipal or national. 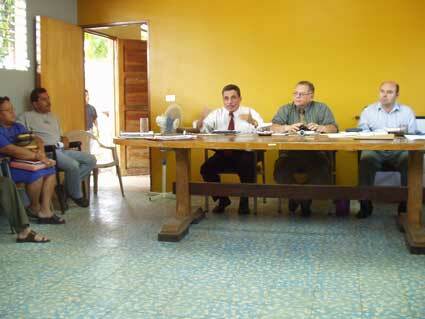 Left: Meeting presided by the Mayor of Guazapa, Juvenal Leiva Mejía, with a presentation by FUNDAR to informar community leaders about their archaeological heritage. Right: The first slide of that presentation. 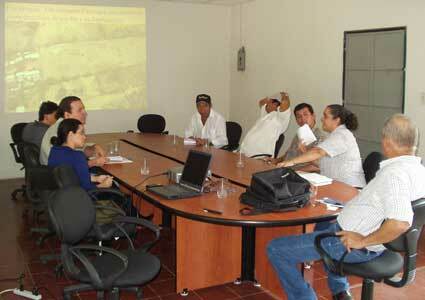 FUNDAR has had many meetings with the Municipality of Aguilares and CONCULTURA about the protection of Cihuatán. Even though Cihuatán is the largest archaeological park in El Salvador, it only covers 1/4 of the total site area. The bulk of the site is on private land which in the future could be subdivided or subject to other destructive development. In particular, we have discussed the widespread problem of "pirate" subdivisions, where grading and other work is done without any permits. The implementation of protection measures in 2007 (see under Our Fight Against Looting and Illicit Traffic) which were promoted by FUNDAR helps reduce these threats, because now CONCULTURA's permission is needed for any development projects proposed in the area of Cihuatán. Despite this, we must still deal with the potential problem of "pirate" subdivisions. Left: Meeting about a "pirate" subdivision on the edge of the Cihuatán archaeological site with representatives from the Municipality of Aguilares, CONCULTURA, and FUNDAR. Participating are: Jorge Galdámez of the Legal Department of CONCULTURA (yellow shirt), Claudia Ramírez of the Department of Archaeology (black shirt), and Karen Bruhns of FUNDAR (white shirt). Right: Map preparted by FUNDAR for CONCULTURA showing the total area of Cihuatán in blue and the archaeological park in green. The yellow areas are current subdivisions, while the red areas are proposed subdivisions. 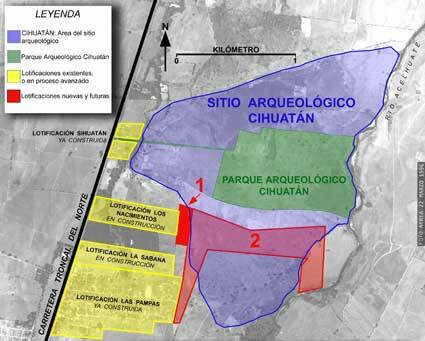 It would obviously be disasterous for Cihuatán if the proposed subdivision marked as "2" were to be approved. The Municipality of Metapán requested FUNDAR's help for evaluating the Azalcualpa archaeological site, located adjacent to Lake Güija. 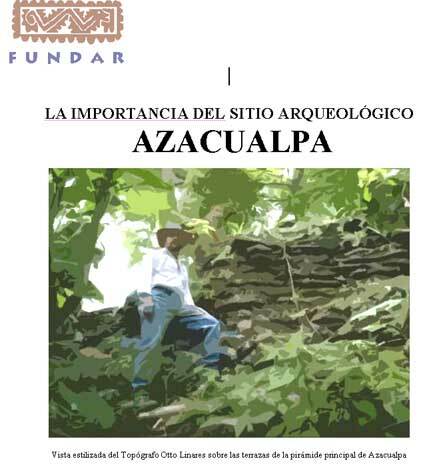 We carried out a study of the site limits and its structures, and recommended that Azacualpa be purchased for a future municipal or national park. This has not yet happened. Left: Mayor Gumercindo Landaverde (right) stands atop a pyramid at Azacualpa, with the San Diego Volcano in the background. As noted by Stanley Boggs (who first recorded the site), Azacualpa's structures are faced with more or less flat pieces of lava. Some of the steps of a stairway are visible in this photograph. Right: Title page of the report presented to the Municipality of Metapán. 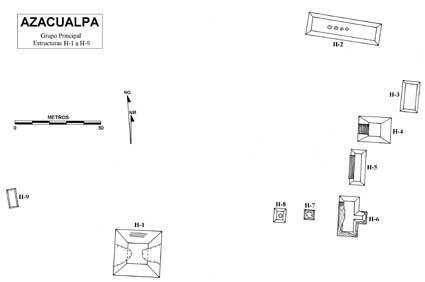 Map prepared by FUNDAR showing the main group of structures at Azacualpa. The dotted lines indicate looting. Izalco has often been noted for its rich cultural heritage. Its jurisdiction has several known archaeological sites, including those recorded by William Fowler, Bárbara Arroyo, and Paul Amaroli in the first season of the Izalco Project. It also has the well known ruins of the 16th century church of Nuestra Señora de la Asunción, which have been investigated by Amaroli. FUNDAR has had several meetings with the Municipality of Izalco about its archaeological heritage, and they have been especially interested in the potential for archaeological tourism. FUNDAR has responded with proposals for archaeological reconnassiance to obtain a thorough inventory of Izalco's sites, on which to base concrete recommendations for their conservation and to identify candidates for archaeological parks. 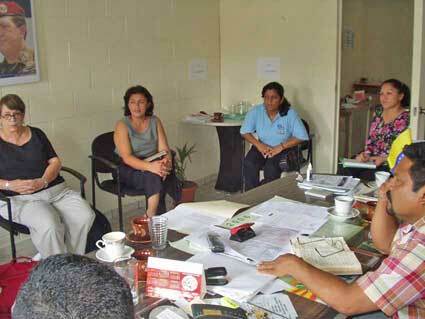 One of the meetings with the Municipality of Izalco. Mayor Alexis Portillo is at the center of the table. The ancient city of Las Marías - the largest archaeological site known in El Salvador - is in the jurisdiction of the Municipality of Quezaltepeque. 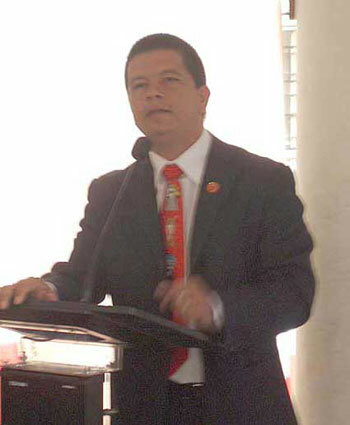 Thanks to the iniciative of Its mayor, Manuel Flores, Quezaltepeque has become the first municipality in El Salvador to implement a municipal decree to protect its archaeology, in this case the Las Marías site. 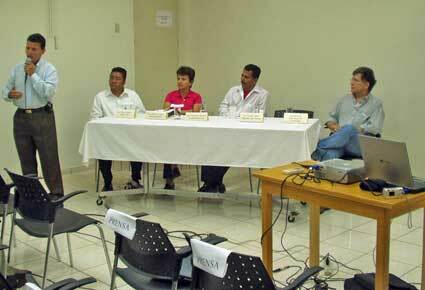 FUNDAR has participated in meetings with the municipality and CONCULTURA about Las Marías and its protection. Left: Manuel Flores, Mayor of Quezaltepeque, gives the introduction to a FUNDAR presentation about the Las Marías archaeological site. Right: Paul Amaroli and Manuel Flores prepare the equipment for the presentation. MICGUAZAPA signifies "Microregión del Cerro de Guazapa" (Microregion of Guazapa Volcano), an organization that brings together the municipalities which share this mountain: Suchitoto, Tonacatepeque, San José Guayabal, and Guazapa. 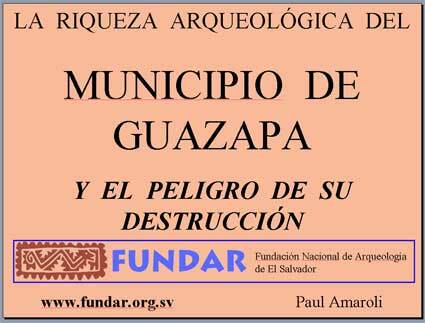 At the request of MICGUAZAPA, FUNDAR has given two presentations about the archaeological heritage of this region, one in the organizations headquarters in Guazapa, and the other in Suchitoto (in which a management plan for Guazapa Volcano was presented by the Ministry of the Environment). The presentation at Guazapa was given by Fabricio Valdivieso (then Head of the Department of Archaeology, CONCULTURA) and Paul Amaroli. 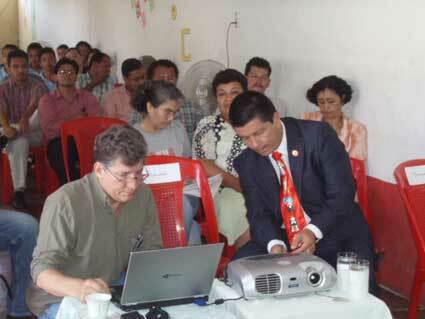 Presentation given at the headquarters of MICGUAZAPA. 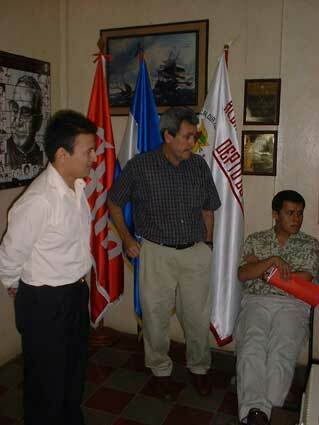 Fabricio Valdivieso (Left, in a light colored shirt) and Héctor Hymede (right, Manager of MICGUAZAPA) appear here.